General Hospital (GH) spoilers reveal that one ABC soap star is facing some wild fan attacks. The trouble started with a recent scene on GH. Curtis (Donnell Turner) made some negative comments about Jason (Steve Burton) during a chat with Drew (Billy Miller). He suggested Jason had “the personality of concrete,” but that statement didn’t go over well with Jason and “JaSam” supporters. However, the criticism is kind of ridiculous. It makes sense that Curtis would want to drag Jason a bit. He was trying to make his pal feel better! Many people would use this tactic if a friend in real life was dealing with a breakup. Curtis made it clear from the beginning that he had Drew’s back, so why would he be loyal to Jason? He has no reason to be on the side of Drew’s brother. Regardless, it’s not like Donnell Turner writes his own lines. If some General Hospital fans have an issue with the content and dialogue, they need to take it up with the writers. Turner’s just doing his job and saying the words he’s supposed to say. Of course, that didn’t stop the crazies from coming out and sending angry messages. Turner decided he had to speak up when Twitter users proved relentless. 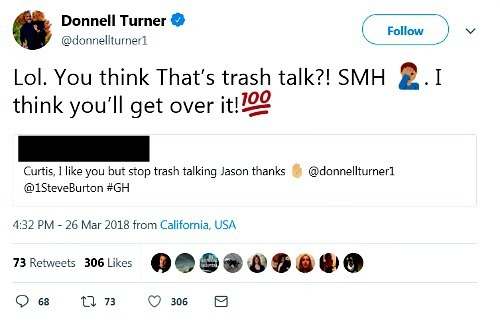 One fan said, “Curtis, I like you but stop trash talking Jason thanks.” She tagged both Turner and Steve Burton in her tweet. Turner wasn’t responsible for the words in that scene, but he couldn’t resist weighing in on how mild the insult was. “Lol. You think That’s trash talk?! SMH. I think you’ll get over it!” Jason doesn’t seem like the kind of guy who would care what Curtis says anyway. Calling it “trash talk” might be a little extreme in this case. Turner faced other attacks as well, but those who can separate fiction from reality were quick to defend him. He later thanked everyone who was in his corner. Turner said, “Seriously LOVE them (sane) GH Fans!” He’s definitely appreciative of everyone who knows how to enjoy the show without coming at him personally over things beyond his control. General Hospital spoilers state that Curtis will continue to be there for Drew, which is great since he could really use support right now. As for Turner, he’ll just keep serving up fantastic performances! We’ll give you updates as other GH news comes in. Stay tuned to the ABC soap and don’t forget to check CDL often for the latest General Hospital spoilers, updates and news.